Paddle in sun-protective comfort with our Paddler&apos;s Hat. Certified UPF 50+ sun protection, our Hat also features glare protection, wind resistant front brim for extra stability, temperature regulation & more. • Maximum sun protection - fabric is certified UPF 50+, the highest given. • An abundance of shade - broad brim protects from both sun & rain. • Staying cool with extra ventilation through a back vent & side grommets. 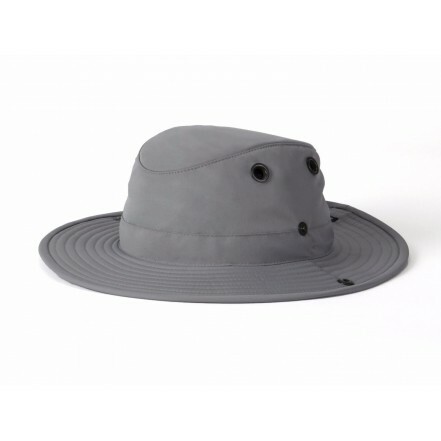 • Wind stability through an extra stiff front brim & plastic wiring around the whole brim. • Keeping it on in windy conditions through the wind cord & size cinch system. • Staying dry perspiration is wicked away by a moisture wicking sweatband. • Seeing clearer glare is reduced by the hunter green underbrim. • Floatability ensured by foam in both the brim & crown. • Snap up sides for added wind stability & for added style. • Fabric is water-repellent through Schoeller® Technologies ecorepel®. • Temperature is regulated with Schoeller® Fabric c_change® membrane. • Keep valuables safe in the secret pocket. • Secure your Hat while portaging with rear brim loop for clip - loop also holds wind cords when not in use. Brim size: Front & back: 2 ; Sides: 2 3/8. Weight: 3.2 oz / 91 g.
Fabric: From Schoeller® Switerland: 73% polyester, 27% polyurethane. Care: Machine wash cool water, delicate cycle or hand wash; Reshape & air-dry. • Normal wear & tear. Tilley Endurables® will repair or replace your hat. Tilley Endurables® customer service department reserves the right to determine what constitutes normal wear & tear, poor workmanship, faulty material, misuse and/or improper care. How do I register my Tilley® hat? All Tilley hats with a lifetime guarantee warranty must be registered within 90 days of purchase for the guarantee to be activated. 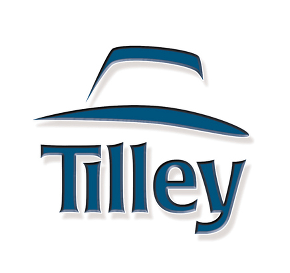 Click here to learn how to register your Tilley® hat.